In this dramatic, deal-by-deal portrait of legendary and, until now, secretive financier Carl Icahn, bestselling business writer Mark Stevens takes us behind the scenes of some of the biggest deals in U.S. corporate history: Icahn's multibillion dollar raid on Phillips Petrolium; his bold move on Texaco's hidebound management, which netted him $500 million in the largest single transaction ever recorded by the New York Stock Exchange; Icahn's prolonged battle with CEO David Roderick to break apart the once mighty steel giant USX; and his stunning takeover of TWA. 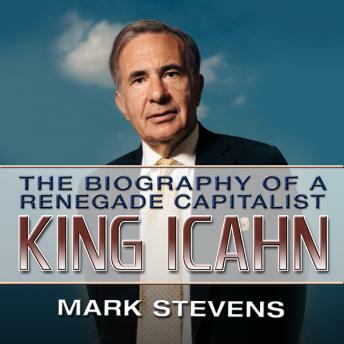 To write this fascinating audio book, Mark Stevens has utilized to the ultimate his incisive investigative skills and his extraordinary access to Icahn himself as well as Icahn's friends, associates, adversaries, and critics-those who rode on his takeover bandwagon, and those who fell beneath its wheeling and dealing. The story he has to tell is that of a bookish boy from Bayswater who went to Princeton, studied philosophy, dropped out of medical school, landed as a minor player on Wall Street, and then had a billion-dollar epiphany-a means of "controlling the destiny of corporations" that would ultimately earn him his fortune. Along with the inside details of the deals that defined the high-flying eighties, Stevens provides a vivid, totally unauthorized profile of Icahn himself. At times deceptively disorganized and absentminded but a ruthlessly brilliant tactician when the chips are down, Icahn won his place at the pinnacle of capitalism by realizing that America's CEOs could be "persuaded" to spend millions in corporate funds or search for white knights to avert a takeover that might cost them their jobs. It was a plan of predatory genius; in the seventies and eighties Icahn garnered huge profits time after time-until he devoured TWA, and found that his ambitions were greater than his management talents. With his very fortune hanging in the balance, Icahn engaged in epic negotiations with the Pension Benefit Guarantee Board, engineering what may be the premiere victory of his career. A fascinating tale with a cast of characters that includes Michael Milken, Ivan Boesky, T. Boone Pickens, Dennis Levine, and most of the other key players of the takeover era. King Icahn is the first biography of the business buccaneer who changed the course of corporate America.